The Friends entered a tree into the Christmas Tree Festival as usual this year. 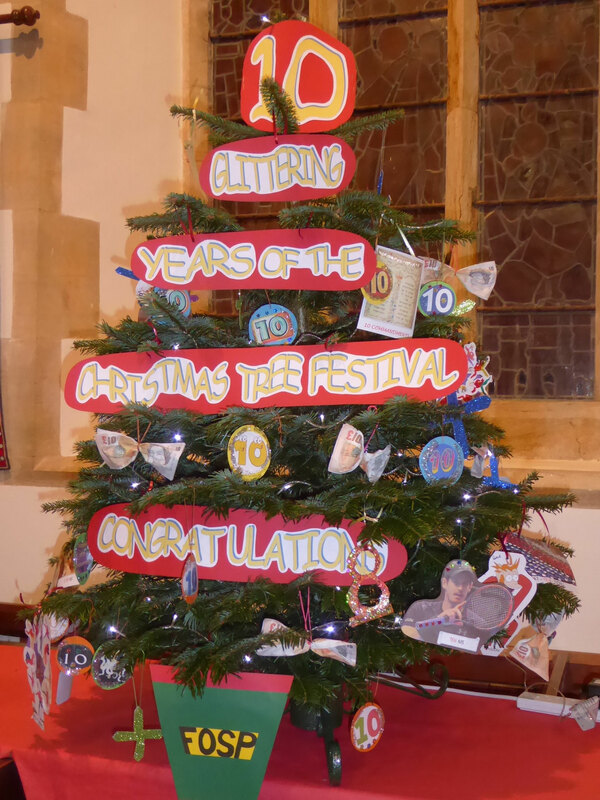 The theme for our tree was "Celebrating 10 years of the Festival". 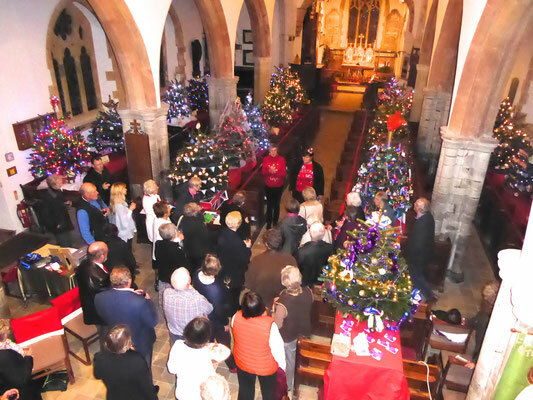 On Friday evening (9 Dec) FOSP hosted a drinks and nibbles party for the organisers, helpers and tree sponsors, to thank them for keeping this very special occasion going for so long. 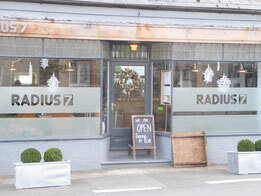 FOSP held a Quiz & Curry night at Radius 7 restaurant in Stoke Fleming on Thursday 6 November. About 45 people attended and enjoyed a very convivial and mind-stretching evening. Quiz-masters John Harrow and Rick Kemp found some interesting and taxing questions and the competition was fierce. Thanks to everyone who came and contributed to the fun, and between them added over £200 to the FOSP funds. 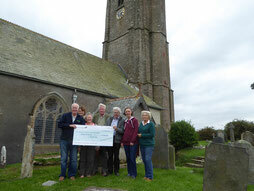 The FOSP Committee seen presenting a cheque for £15,000 to the PCC of St Peter's church. This was the total sum collected for the renovation of the tower clock, whose newly re-gilded face can be seen in the photograph. 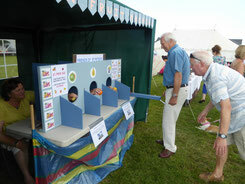 We took the Human Fruit Machine to the Stoke Fleming Hort & Sport Show this afternoon. It proved very popular, especially with some of the younger visitors. Thanks to everyone for their support. 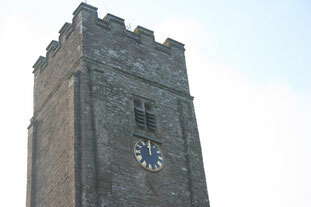 The tower clock was delivered and re-installed during week commencing 22 August. Worked on by Luke and Dave from Cumbria Clock Co and Phil and John from Vitruvius Building Conservation (steeple-jacks). Looking really good. 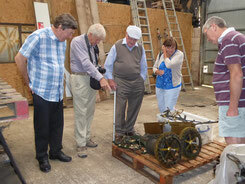 Today a group of members went to see the Tower clock in the final stages of its restoration at Cumbria Clock Co's workshops near Crediton - very interesting. We saw the newly repainted and re-gilded face, and the working parts of the clock cleaned and ready to be delivered and reassembled. Despite the unseasonable weather the big village “Picnic” organised by Friends of St Peter’s to celebrate the Queen’s 90th birthday was very well attended. 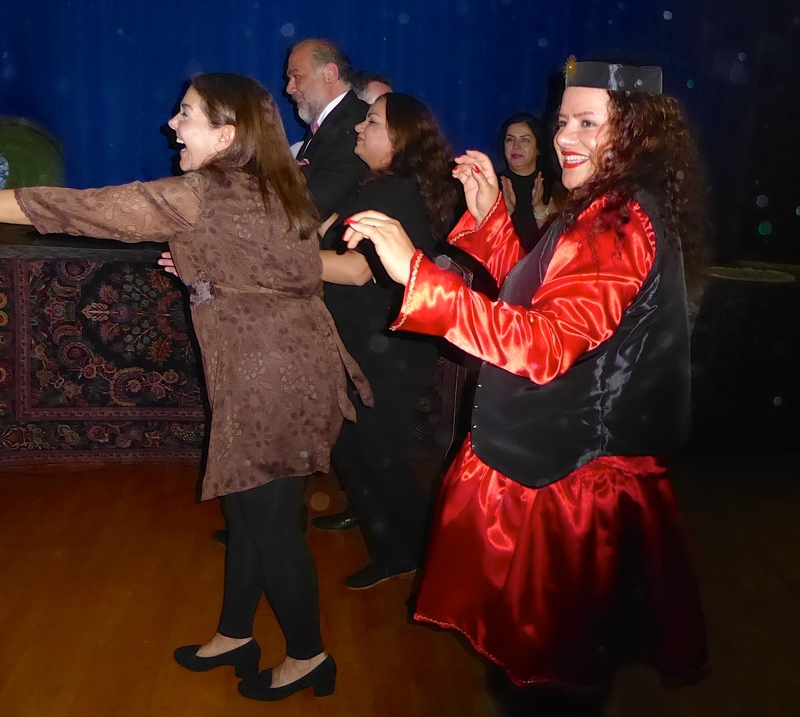 All 150 available tickets were sold and everyone thoroughly enjoyed the evening. 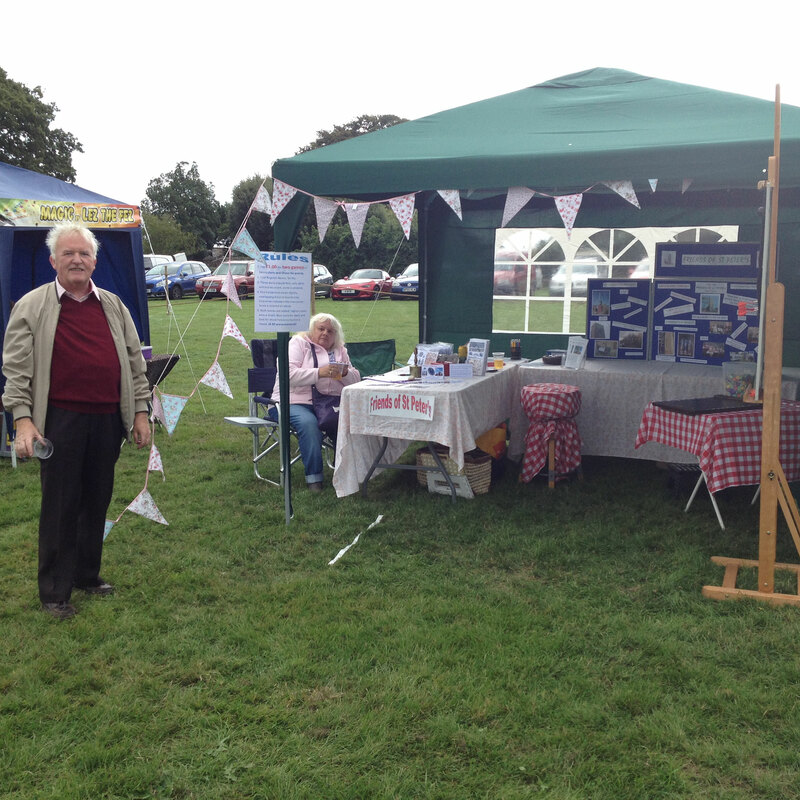 It turned out to be a real community get-together and, thanks to Mary and Geoffrey Newman for use of their fine wedding marquee, everyone was able to enjoy their picnic in the dry. 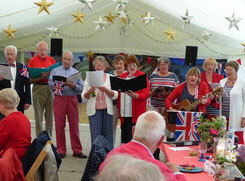 We were royally entertained to a selection of old English folk-songs, some with new local lyrics, by the Picnic Singers, thanks to Lawrence Gee, Gail Dorrington and the singers. 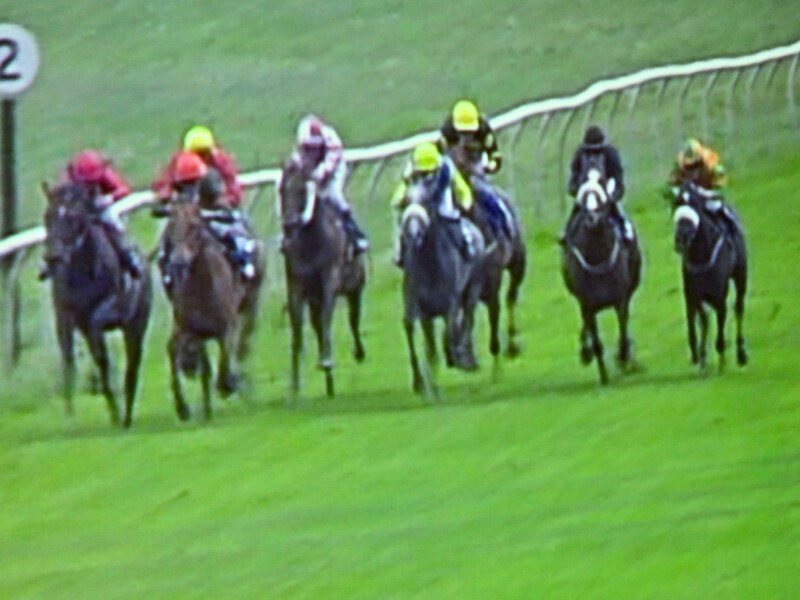 Thanks also go to Mark Malley for technical support using equipment from Isonify Ltd. Thanks to everyone who chipped in and braved the weather to support this wonderful whole Village event. FOSP has now paid the PCC a deposit of £7,000 for the removal, overhaul and storage of the tower clock. Cumbria Clock Company will remove the clock during week commencing 18 January and it will be away until the tower work is complete. As part of the overhaul the clock face will be repainted and re-gilded. Although the chimes will be silent for about 6 months, they will return to normal in the Autumn.